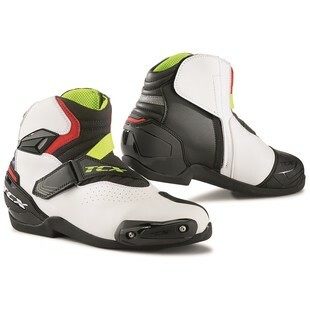 The name of the TCX Roadster 2 Air Boots pretty much says all that needs to be said. They are sleek. They are built for power. They are not holding anything back, and they are doing so with style. Building on the success of their predecessor, the TCX Roadster 2 Air Boots have arrived for the Fall of 2017 and are absolutely ready to ride! As the coupe of the TCX lineup, the Roadster 2 Air Boots look as if a pair of race boots have been sawed off just above the ankle and now, in the place of what stood there before, now resides a set of above-the-ankle riding shoes. In doing so, TCX has offered riders high-end protection, yet with the added comfort of a lower cut shoe that allows for more mobility throughout the ankle. To maximize the enjoyment in the wearability of the shoes, TCX has outfitted them with Air Tech breathable lining, a perforated microfiber upper, and added padding to the rear for increased absorption of impacts. Additional features of the Roadster 2 Air Boots include replaceable PU toe sliders, malleolus micro-injected reinforcements, and air intake vents for increased airflow. Like any good roadster out there, the Roadster 2 Boots from TCX take to the streets with precision, style, and purpose that few others can match. For the Fall of 2017, they are now available for like-minded motorcyclists who are likely to wear them.